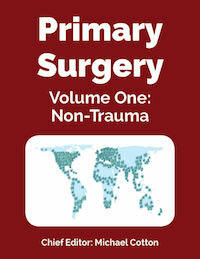 From the Chief Editor: Primary Surgery (Vol. 1: Non-Trauma) has established itself as the most used and most useful text for the medical practitioner in poor-resource settings who is obliged to manage surgical cases. It is particularly adapted for those whose surgical experience is basic or minimal. Importantly, it has extensive advice about pitfalls to avoid, and what to do if things go wrong. It is written in simple style, particularly for those whose mother tongue is not English. It is not a text which discusses the latest up-to-date technology, but it is not out-of-date being a synthesis of the best advice from a myriad of surgeons practicing for many years in low- and middle-income countries. This new edition builds and expands on the success of Maurice King's seminal first edition.